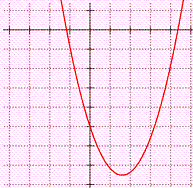 Given the following equation, what is the vertex? 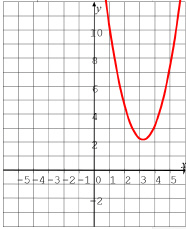 Given the equation , which of the following will be the equation of the axis of symmetry? A tennis ball is shot straight into the air. 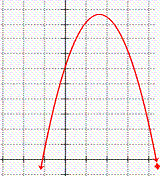 The height of the ball is given by the following equation: , where “h” is the height in meters and “t” is the time in seconds. If I’m looking for the maximum height of the ball, then which one of the following would I solve for? A tennis ball is shot straight into the air. The height of the ball is given by the following equation: , where “h” is the height in meters and “t” is the time in seconds. If I’m looking for when the ball will hit the ground, then which one of the following would I solve for? A tennis ball is shot straight into the air. The height of the ball is given by the following equation: , where “h” is the height in meters and “t” is the time in seconds. If I’m looking for height of the person who threw the ball, then which one of the following would I solve for? A racket ball is shot straight into the air. The height of the ball is given by the following equation: , where “h” is the height in meters and “t” is the time in seconds. Find the time it takes to reach the maximum height. A rocket is launched into the sky and the height of the rocket is given by the formula: . What is the maximum height of the rocket? 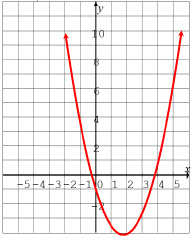 Given the equation , and that the coordinate is the vertex, what is the value of “c” if the point is also on the graph. 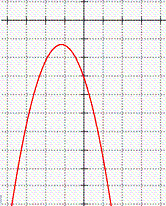 Given that the coefficients “a”, “b” and “c” are all positive in the equation , which of the following is a possible graph of the parabola? 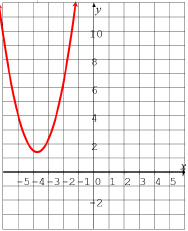 Given the equation and that the point is on the graph. Which of the following is the other x-intercept? 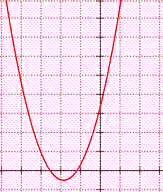 Given that and a horizontal line intersects a parabola at the points (-2,17) and (10,17). 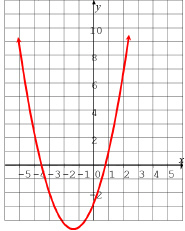 Which of the following is a possible equation of this parabola?